Welcome to the January 15th edition of Warehouse & Logistics News. Every cloud has a silver lining and businesses’ current anxiety about what’s going to happen over the next few months is turning out to be good news for parts of the warehouse and logistics industry. 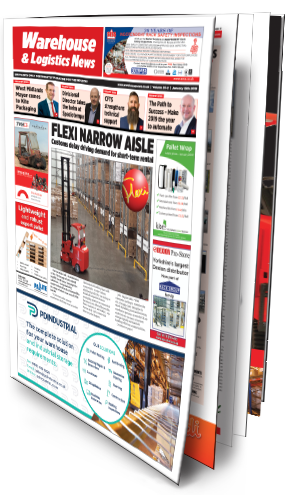 On our front cover Narrow Aisle reports the number of their Flexi articulated warehouse trucks out on short-term rental is up 25 percent on last year. Narrow Aisle Commercial Director John Maguire says third party logistics companies and warehouse operators are bolstering their fleets with extra Flexi trucks to cope with the additional goods they are storing on behalf of companies stockpiling ahead of Brexit. We hear a lot at the moment about the need for short term storage, but some people are thinking longer term. Smart-Space, a leading manufacturer and installer of re-locatable, semipermanent and permanent buildings has completed construction of a 250-pallet packaging store for Cranswick plc, extending its refrigeration area at the food producer’s Hull cooked chicken facility, helping the business continue its expansion in retail and maintain its 20% year-onyear growth. This is the season for keeping New Year resolutions. Are you up to speed on the rules and regulations about storage equipment? In our SEMA advice column we look at compliance with the rules for safe installation of racking, covered by SEMA’s Codes of Practice. If you’re in palletised freight and are thinking about joining a pallet network or maybe switching networks, UPN have strengthened the Southern England part of their network with two new members, Erith-based Westons Transport, and Deptford based First Choice Transport. Or perhaps you are reviewing how you move your palletised goods, making best use of the space inside vehicles and cutting down lorry journeys. We interview Danny Watson, founder and MD of Danload Stacking Systems, whose innovative Multistack collapsible HGV racking systems can be used for multiple pallets and fold away when not in use. In our Doors & Curtains feature Kenfield’s secondary doors have helped Aldi’s cold stores reduce their energy consumption by over half. 24/7 working puts strain on industrial doors, so Hörmann are encouraging customers to ensure their doors receive regular maintenance checks and sara LBS flags up the importance of working directly with suppliers who can project manage installation. In our Lighting feature we hear how to get the best energy efficient LEDs using the Carbon Trust’s ‘green’ business directory of companies and we have details of DANLERS’ lighting controls with wireless connectivity. In our Lifting Gear feature, TVH is now offering details of its replacement parts for aerial work platforms on the webshop MyTotalSource. Kalmar is supplying reachstackers to two container terminals in central Chile and Lödige Industries has won an award from the Romanian Chamber of Commerce for its world-renowned lifting and handling equipment. And finally there’s more bad weather to come, but this time it’s physical. With ice and snow likely to settle over the next two months, Contact Attachments are busy helping customers prepare to keep working smoothly through the winter with their forklift compatible and pedestrianoperated salt spreaders and gritters. Keep warm.